Finally we have had a drier month. The rain has kept away and we have only had 27mm of rain this month. This means that the cows are now on dry fields and they are not making a mess when out. 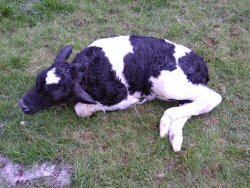 Only 3 cows have calved this month 1 Simmental heifer one black and white bull (pictured here on the left at about 1 hour old) and one Blonde aquataine bull (this sadly was born dead however). The Oat crop is looking well and is now about 400mm high next month the "ears" of corn will appear on it. 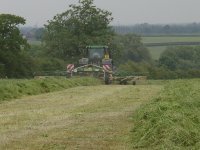 June has brought Silaging, which we did, on the 13th with Moretons finishing agricultural contracting we asked Richardson's contractors to silage for us. 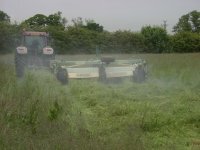 The equipment they use is much larger and instead of a tractor powered forage harvester (see June 2000 report) they use a "self-propelled machine. 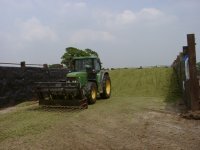 They completed our silage in less than 6 hours having done 16ha (40 acres). 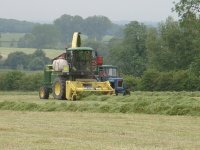 Here are pictures of the forager, Mower and buckrake. Thanks Chris and we'll see you for second cut. Foot and Mouth seems to be (I hope) on the decrease But lets not forget it just yet. 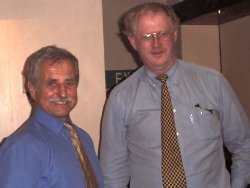 I attended a National Farmers Union meeting at which our National President Ben Gill was the guest speaker here is Ben (pictured on the right) with our Cheshire County Chairman Alan Gardiner. 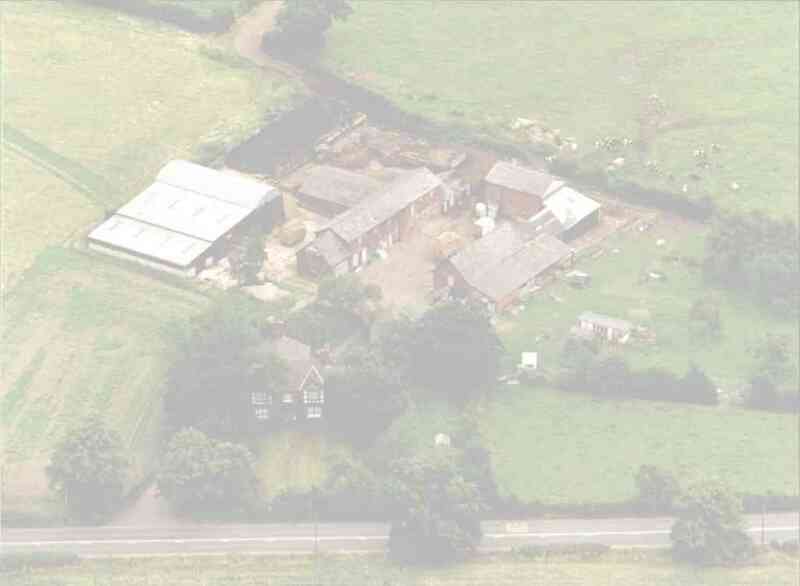 Normally this month I would be giving a Cheshire Show report (again see June 2000) however Foot and Mouth saw that cancelled. Judging by the number of emails we are getting many of you are studying farming, this month there were 18 letters in just 1 week thank you ALL it makes doing the site so worthwhile, and as those of you who have written know we DO reply. As I write this we have just mown for haymaking on the Heifer Meadow (so it will probably rain). Alan our friend and combine driver will bale it for us. This month's first Summer Nature report is now available including our Moorhen on the pond's successful second nest and some of the small mammals to be found around the farm. Paul our cameraman is currently off work due to injury, he fell off the "OUCH - OK I'll not tell - "the toilet!!!!!"" so he has been photographing more. 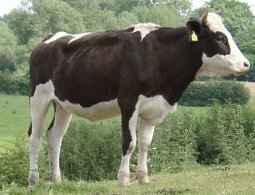 Slide your mouse quickly back and too over this heifer and watch her move her head.